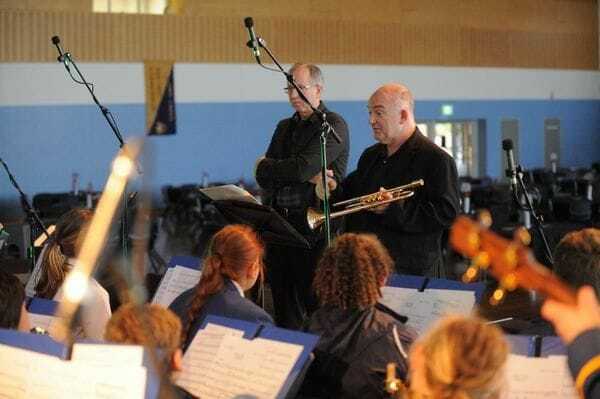 Internationally acclaimed jazz musician James Morrison has given a master class to students from St Michaels College in Adelaide prior to a sold-old evening concert at the school. 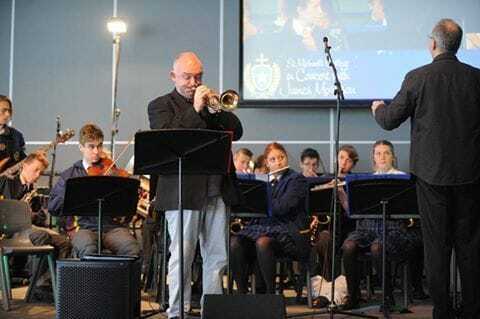 In a strong reflection of the Lasallian school's outstanding commitment to music and the performing arts, 140 talented young performers from St Michaels College and the local Our Lady Star of the Sea Primary School accompanied James Morrison in front of a packed audience on 21 September in Founder's Hall on the secondary campus. The multi-instrumental Australian jazz musician demonstrated his immense skills across the trumpet, clarinet and flugelhorn to an enthralled audience. Talented singer and artistic director Brian Gilbertson, himself a graduate of St Michaels College, acted as Master of Ceremonies in an evening that truly showcased the exceptional musical skills of the college community. Proud alumni joined with current students and staff for the concert. "It was a very real expression of what can be achieved through a combination of skill, determination and commitment", said College Principal Mr John Foley. "The audience remained totally enthralled and particularly proud throughout the evening", he added.